Digital Graphics & Vinyl transform your shop into a remarkable and outstanding establishment. If you want your storefront to catch your customer’s eye in an instants notice, Digital Graphic & Vinyl may be the best solution for you. Digital Graphics & Vinyl can be placed on any surface. You can bring your original design, or we are happy to design your needs for you. We have been providing high quality designs for over 20 years. We are also happy to install them for you if you have any trouble. No matter what your needs are, Quick Signs is there for you. 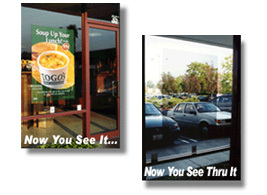 Store front, full color graphics create impactive results! Digital Graphics & Vinyl can be placed on windows, posters and even vehicles. Utilizing our special design skills, Digital Graphics & Vinyl can even have the ability to look 3 dimensional! Digital Graphics & Vinyl can be printed and mounted on a variety of hard or semi-hard surfaces. From foam-core, to PVC, to acrylic, you have the ability to choose the rigidity of your poster and its custom shape! One of our more outstanding products is a sticker that has a special effect of being transparent from backside, but completely opaque on the front side. Such stickers are placed on windows that need to been seen through form the inside, but not on the outside! Vinyl stickers and decals are shapes, logos and letters cut out of solid-color vinyl sheets. The quality of vinyl used is of high quality and extremely durable for many years. Use them on your store front windows to sell a service, Have your logo and motto printed and placed on your vehicle. Or have them mounted on a compatable surface and use it as a sign! If you need help with your design, there are 100's of fonts and over 5000 designs to choose from.